The Vancouver Condo Buzz » The Ave Boutique Residences in North Vancouver’s Marine Drive District Now Selling! Located off of Marine at Pemberton and West 16th Street North Vancouver, The Ave Boutique Residences in the North Shore will feature excellent proximity to shopping, transit routes, outdoor recreation and restaurants. The Ave North Vancouver condos certainly stands apart from other developments because of its bold and modern architecture. However, that’s not the only unique feature of these boutique North Shore residences. Located in the heart of the new Marine Drive North Vancouver district, The Ave Boutique Residences will feature street level retail stores and superior craftsmanship by Solace Ventures Inc and Alto Construction Limited. Just one block from Marine Drive at the corner of Pemberton and West 16th Street North Vancouver, The Ave condos presents a quieter and more peaceful setting then living right on Marine Drive. From biking and walking trails to beautiful urban parks and the water, the centrally located The Ave North Shore boutique residences is also within walking distance to shops, cafes, restaurants, outdoor pursuits, recreation centres and limitless opportunities to have fun. The Ave North Vancouver condos is an exclusive collection of spacious and truly modern homes where residents can enjoy expansive windows, over height ceilings up to 9 to 13 feet high and open floor plans that are flexible and very spacious. 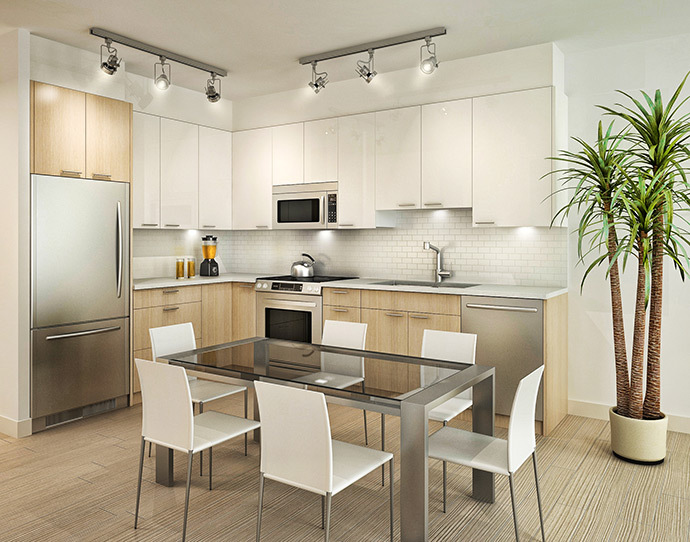 The floor plans at The Ave North Shore range between 1 bedroom with work stations to 2 bedroom and den layouts. In addition to Solace Ventures developers and Alto Construction, the Cristina Oberti interior design will select only the finest finishes and interior palettes for your new home. The architect for this modern design project is Wensley Architecture. For more information and to priority register, please visit www.theaveliving.com right now. 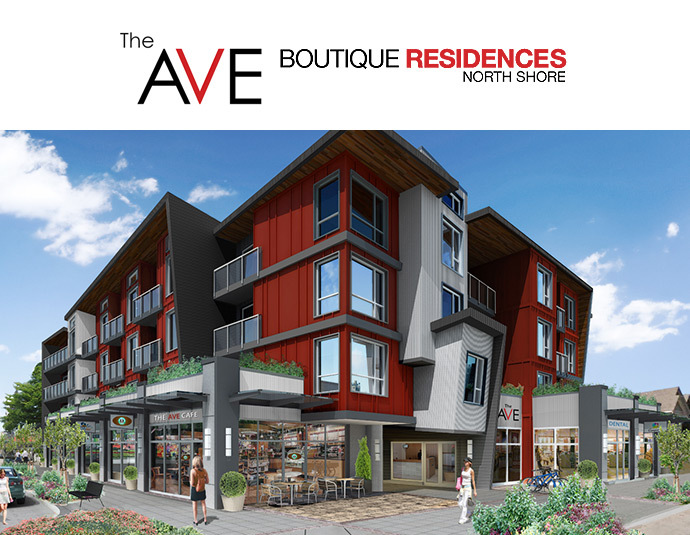 “Contemporary style and comfort enclosed in modern architecture” is how the marketing team has described The Ave boutique residences in North Vancouver’s Marine Drive district online. And guess what? They are absolutely correct! Here are some of the stunning features at The Ave North Shore condo project: expansive windows, overheight ceilings up to 13 feet in select homes, spacious outdoor patios, decks or balconies (some homes have 2 patios or 2 balconies too!) in addition to two contemporary colour palettes (light and dark). Other features include designer roller shades on all windows, wide plank premium laminate floors in the living, dining, kitchen and entry and contemporary stain resistant carpets in the bedrooms with acoustic underlay for sound buffering. Some featured floor plans also have custom work stations. 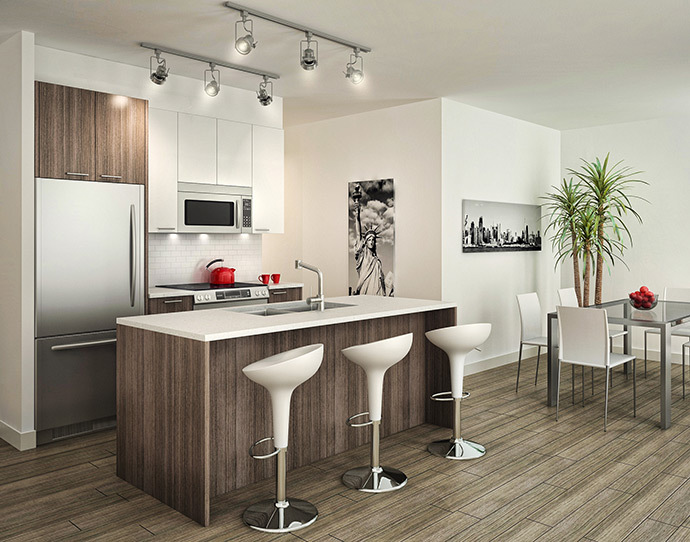 The kitchens at the North Shore Ave Condos will include open and entertainment friendly spaces that includes contemporary dual tone cabinetry with 42” upper cabinets, full height pantries in select suites and soft close cabinets and drawers. Other kitchen features include brushed track lights and under cabinetry task lighting, Upscale energy efficient KitchenAid appliance package and an undermount double stainless steel sink with sink waste disposal unit. The Ave North Vancouver condos will also come with sleek polished chrome single lever faucet with spray, quartz counters and other beautiful finishes. The spectacular bathrooms will feature contemporary cabinets (that match the kitchen) in addition to soft closing cabinetry and drawers. There is also a designer collection of accessories in polished chrome finish, imported large format tile, contemporary glass mosaic inset into imported shower surround wall tile and designer under mount sink. The bathrooms at the new North Vancouver The Ave condos will feature quartz counters, sleek polished chrome single lever faucet and European style soaker tub with polished chrome bath and shower head collection. Please note that all floor plans are subject to change at any time and are only draft layouts. Please speak with a sales representative at The Ave North Vancouver boutique residences for the latest on availability, pricing and changes to these floorplans. For your peace of mind, The Ave North Shore boutique residences will have convenient and easy key fob building access control in addition to guest building access by entry phone system and gated secured underground parking. All homes will come with the National Home Warranty as well. There are also seven strata commercial units with parking available at The Ave North Vancouver and they range in size from 750 square feet (approximately).